Saturday at the book store I rummaged through shelves of painting books, looking for a painting intro book so I can remember everything I’ve forgotten about painting… and instead found two books about Bob Ross and the Joy of Painting. For those who are too young or did not watch television in the 80s or 90s, Bob Ross became a pop culture painting guru while hosting a painting show on PBS. I grew up watching his show… and I remember him saying “Happy Little Tree…” or “Happy Little Clouds” while he painted amazing landscapes in what seemed like only minutes. Although Ross died in 1995 he left behind a painting legacy. It bothered me when I first saw the books. Why? Because I haven’t thought about Bob Ross, or painted, for years. I have been telling myself for the last couple years that I was going to get back into oil painting. But then I moved to Colorado… and then I went to Africa… and then I went to China. All of those travels depleted my savings account. And then I got married and moved to the Northwest for graduate school. Last year I traveled to the Philippines, and then took my beautiful wife to see her favorite band the Irish Rovers (for Christmas). Again, savings account depleted. Now I am training for a marathon and that costs money too. Marathons have race entry fees, food, better shoes, travel/lodging, etc. When I saw the Bob Ross painting books I had to have them. 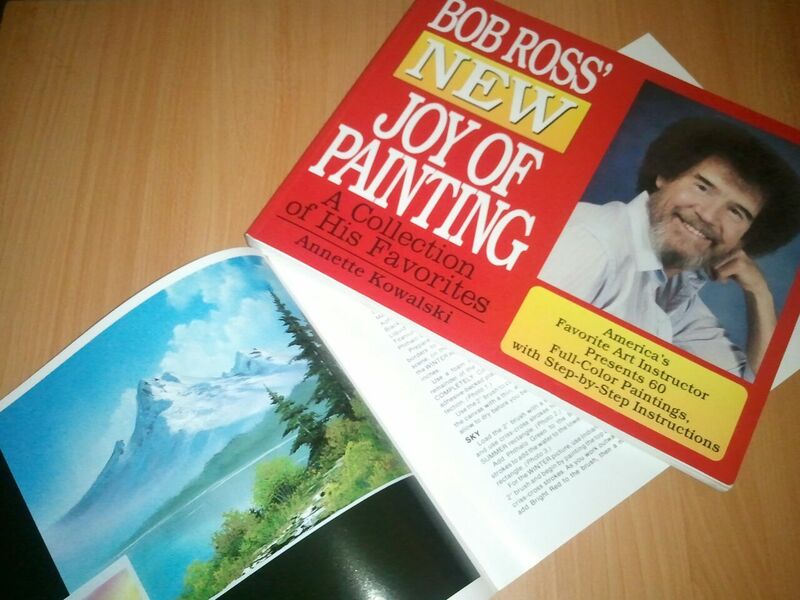 At this point I feel like I need to start collecting painting supplies and books about painting in small amounts until I finally have what is needed to start painting.These two books have color photos of paintings by Bob Ross, along with written and illustrated instructions about how he created the paintings. I have searched craigslist, thrift shops and other places for low-cost or free painting supplies. But it appears that painting supplies are not things discarded lightly or cheaply… so my search is taking longer than I had hoped. I am focused and I hope to start oil painting again by the end of the summer. But this is the third year in a row that I have said this about oil painting. And I’m not Charlie Brown. Poor Charlie Brown wanted to kick the football, but Lucy always pulled it away at the last second. His continued quest to “kick the football” and then his perpetual failure is part of Charlie Brown’s legacy. My oil painting dream is similar to Charlie Brown kicking the football only in the sense that something else always gets in the way of me reaching my goal. But honestly if I have to choose between oil painting or Africa, I choose Africa. If I have to choose between the Philippines or oil painting… I choose the Philippines. I firmly believe I made correct choices. But hopefully my search for the elusive “joy of painting” will not be an infinite quest. Do you have one goal, one dream, in your life that seems to keep escaping you? Do you get around locally and paint. It sounds awesome if you can do both. I stumble to a lot of painters when I travel esp. in coastal areas here in California. Where did you go in Philippines? When I painted before it was landscapes in Ohio and also images from photographs. My wife and I sometimes go to artwalks, where artists have their work outside their shop … and it is like an outdoor museum, but you can buy the work… seeing that also makes me want to paint. When we went to the philippines last year we were in Manila and also Bacolod City.